The kind of precision and dependable construction that has made Allis-Chalmers agricultural equipment an industry leader extends to every unit in the A-C garden tractor line. Power-packed single or smooth twin cylinder engines. Better designed, precision engineered to match any garden or yard need. 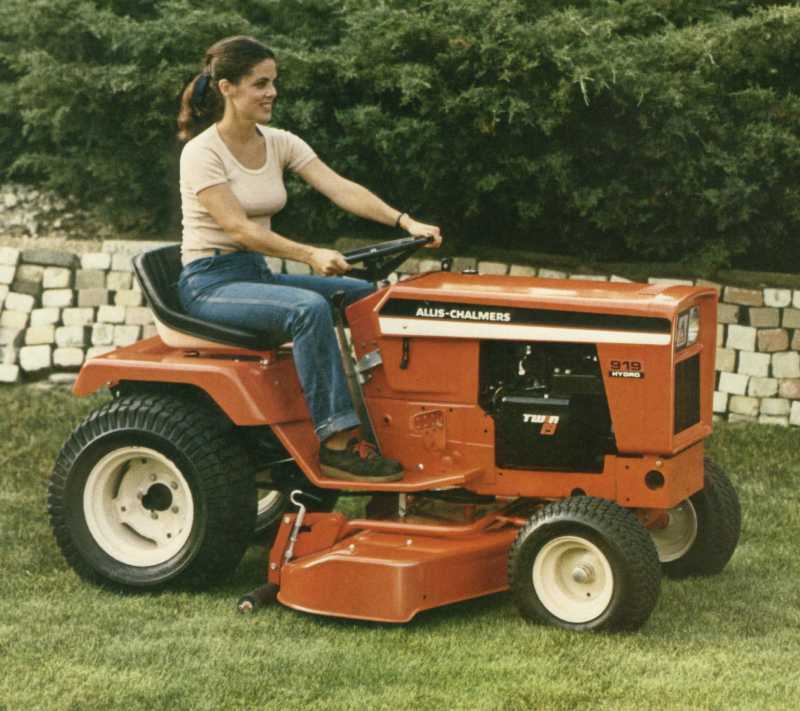 All A-C Lawn and Garden Tractors and Mowers meet or exceed existing safety standards set by the American National Standards Institute. All offer operating features like controlled traction limited slip differential and an anti-scalp mower deck. Look closely at how Allis-Chalmers has designed and engineered these tractors with you the operator foremost in mind. Touch the thick cushioned foam in our spring-suspended seats. Covered with durable heavyweight vinyl, they stand up to years of wet morning dews and heavy rains for best resistance to cracking and peeling. Test-drive one. Feel the power of our engines. Notice how vibrations are minimized to your body. Allis-Chalmers designed and engineered "In-Line" power transfer for our 900 Series tractors. The horsepower produced is transferred in a straight line directly to the gear box in the rear. Open the front and rear hoods. See how easy it is to check oil, change filters and belts or put water in the battery. Equally important is the service you'll receive, before and after the sale from your Allis-Chalmers dealer. He maintains a factory-trained staff and parts inventory for full and friendly service. This assures that even after years of dependable operation, when you need parts or service, your Allis-Chalmers dealer will be there to back up his product. Full-Length Frame. It's the backbone of our tractor. Welded one-piece steel construction gives rigid support. It cradles the engine and power train to assure critical parts alignment. Controlled Traction. When you get into slippery mud, sand or snow, Allis-Chalmers keeps you going with controlled traction. When one wheel slips all power is automatically transferred to the wheel with traction. Puts the power where it's needed. Anti-Scalp Mower Deck. With an Allis-Chalmers garden tractor there's less need to worry about reseeding embarrassing scalp marks. Our mower deck is attached directly to the front axle. As wheels step over rough and hilly terrain, so does the mower deck. Thus the deck remains parallel to the ground surface so grass is cut at an even height.